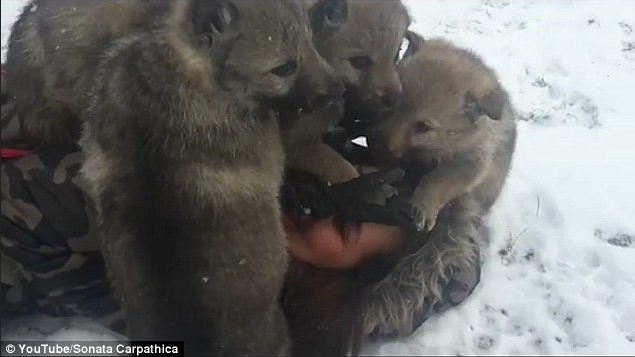 A woman gets Disney-like experience when 12 adorable wolf pups smother her with licks and sniffs as she lays powerless and laughing in the snow. No, we’ve not gone mad and yes, normally getting attacked by a bunch of wolves is not an ideal situation. But we’ll let a pack of soft little furry wolf pups take us on any day with no resistance at all. Just like Sonata Carpathica did when 12 baby wolf dogs came for her all at once. Clearly she is having the time of her life and we want to be her when they all clamber on her face for one big wolf hug.And they love her just as much as she loves them, because she’s been helping their parents raise them at Czechoslovakian Wolfdog Kennel since the day they were born. The Czechoslovakian Wolfdog was officially recognised as a national breed in Czechoslovakia in 1982. Responses to "Dozen adorable Czechoslovakian Wolfdog pups smother woman laughing with joy"